“If you ain’t Dutch, you ain’t much,” my Dad always says. The trouble is, I ain’t Dutch. My parents are, but I am a born and raised Canadian. Why do I call myself Dutch-Canadian although I have never lived in and only briefly visited the Netherlands? My Dutchness comes not from my country of birth but from my parents, and the Dutch community I grew up with. We form and pass down a sense belonging to a specific culture or group through our interactions—from special occasions to our day-to-day activities and communication. For some cultures, the drive to pass down language, practices, and values is strong; this was not true in my home. My parents never tried to teach me Dutch or actively promote a Dutch way of living—in fact, they are proud Canadians. And yet, I still feel a connection to both the counties. My Canada is a lived experience; the memories of my parents and the community create my Holland. If you look around my home, I don’t have a lot of things at home that relate to Holland and they are mixed with items I’ve collected from all over the world. My favorite item is likely overlooked by most visitors to my home. 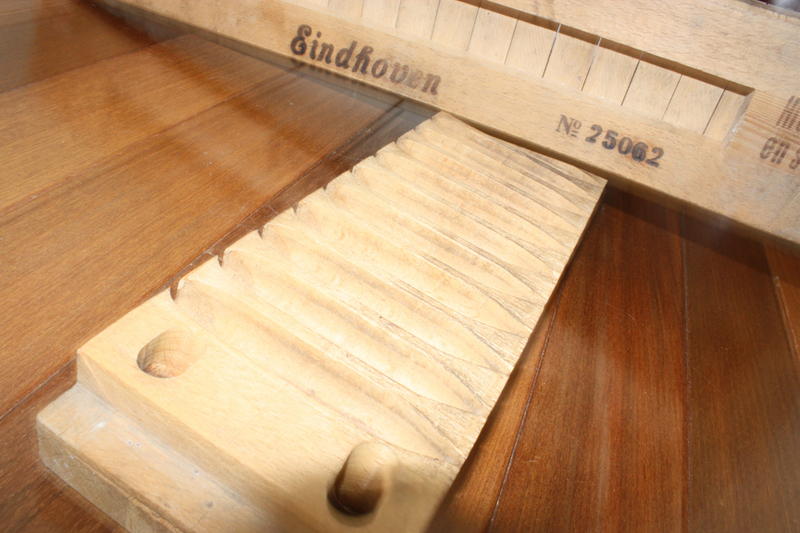 It’s a cigar mold from my maternal Grandpa, Fokko (Franklin) Prins. In Holland, Grandpa Prins his own cigar store behind the house. My great grandfather was a tenant farmer, and there wasn’t enough land for his seven sons, so they had to find alternative work. My Grandpa came to Canada because he has work in Southern Alberta; like many immigrants, he came to Canada with hopes of a better life and more opportunity after the second world war devastated Holland. When look at the mold, it is a connection to my mom, Joanne, and her family. It reminds me of the path my family took from Holland to Canada. Many of my mom’s memories of Holland relate to the war. She was just 7 or 8 when the war ended, but she has clear memories of my grandparents working with the resistance, German soldiers searching for my Grandpa. She also remembers Canadian soldiers sharing oranges and candy after the liberation of Holland. For me these stories are tied to an old, brittle tea set that sits on the book shelve at my parent’s home. As a child, I longed to play with it, but I was never allowed to do more than look at it with supervision. 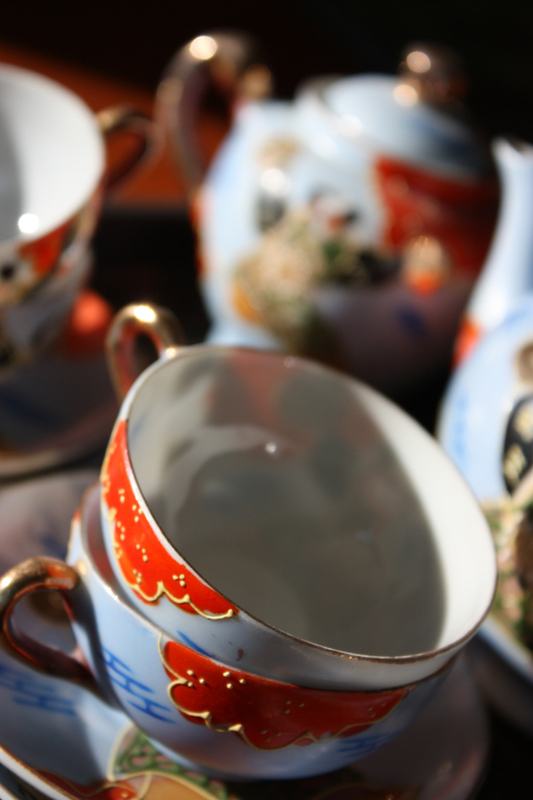 I understood that this tea set was important. My mom would tell me the story of Tom, who came to stay with my mom’s family at the end of the war. He was from Rotterdam where there was not enough food in the city after the bombings so they sent some of the children to farms because people were starving. After the war, his mom returned later and gave the tea set to my mom as a gift. When I am there, my mom brings out the tea set again. It seems even more brittle than usual, that much older. We dust them off, and my mom tries to match the edges of a broken cup. 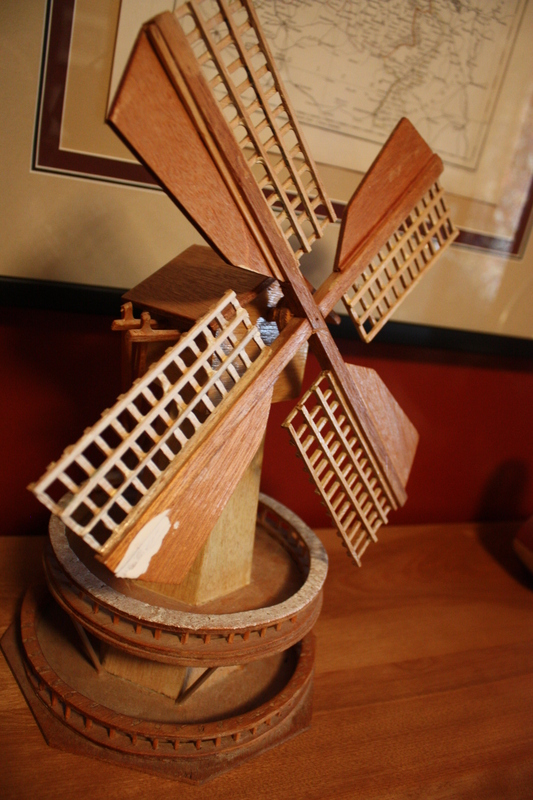 I also have one of the windmills my dad’s father, Johannes (John) Wierstra, made when he retired. It’s got a few dabs of paint on it from when my mom thought about painting it at some point, then stopped. I’ve thought about removing it, but it seems to be part of its history. 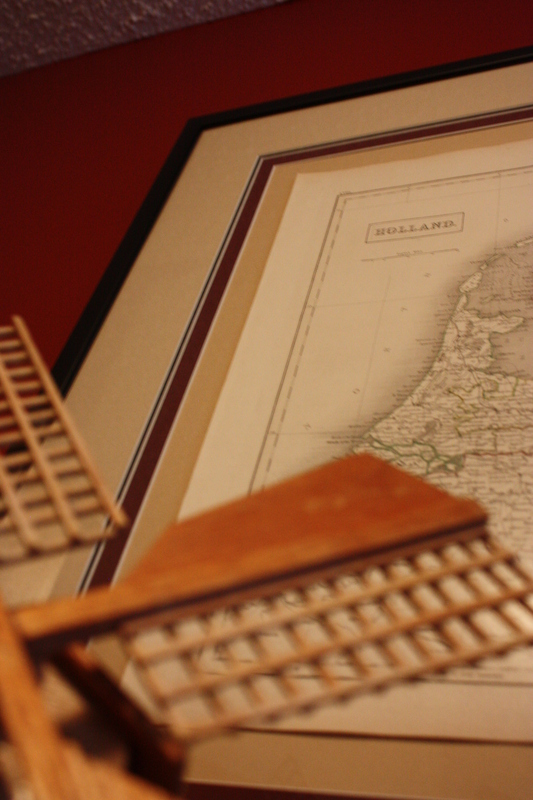 I display it next to an antique map of Holland that was the first present my husband Nick ever gave me. When I started this project, I thought I had my cultural identity firmly established. When I was younger, I thought I was Dutch; when I went to Holland, I realized that I wasn’t. I’ve got elements of the culture, and I can see my history there, but I did not feel part of the country. Holland is where my family is from, but it’s not where I am from, and it wasn’t like going home. I went to Holland to understand that home was Canada. When I began this project, I thought I had my cultural identity sorted: I am a Canadian with roots in Holland. Now I believe that those Dutch roots have played a more prominent role in my identity than I realized. When I interviewed the other Dutch-Canadians, there were many commonalities, not only in the food we ate, but also in how we view the world. After reading and sharing posts from the blog stuffdutchpeoplelike.com, I recognize myself—and my Dutch-Canadian (and Dutch-Australian) friends. I ain’t Dutch, but maybe I’m closer than I originally believed. My heritage weaves within and around me through cultural items, food, community, and family.